The complete Primary Mirror Backplane Support Structure (PMBSS) for the James Webb Space Telescope (JWST). The inset shows the location of the four support mounts of the type that NIST measured. For scale, note the assembly technician in the photo. The PMBSS is the largest single structure on JWST and also the largest precision metrology structure that has ever been built for a NASA program. The National Institute of Standards and Technology (NIST) has accurately measured parts designed for the upcoming James Webb Space Telescope, the long-awaited successor to the Hubble Space Telescope. The NIST-measured composite titanium and stainless steel parts, which support the skeleton for the telescope’s massive mirror, will be used in the final round of NASA’s vibration tests on the mirror assembly before the telescope’s scheduled launch in October 2018. The Webb telescope will travel to an orbit beyond the Moon, contain a mirror much larger than the Hubble’s, and be able to observe the formation of some of the first stars and galaxies more than 13.5 billion years ago. The telescope is the largest piece of precision metrology (measurement) equipment that NASA has been involved in creating. With its size, and the sophistication of its parts, extreme care must be taken to ensure the mirror and instruments remain properly assembled and aligned as they travel into space and face significant temperature changes throughout their journey. “When you have something like this and bring it into orbit, you can’t go up to space and reposition it” if something goes out of position or alignment, said John Stoup, a mechanical engineer at NIST’s Physical Measurement Laboratory in Gaithersburg, Md. Stoup and his colleagues performed measurements of four alignment mounts that support and help to position a major Webb telescope structure known as the Primary Mirror Backplane Support Structure (PMBSS). The structure will hold the telescope’s big 6.5-meter (21-foot) diameter mirror as well as approximately 2,400 kilograms (5,300 pounds) of the telescope’s instruments and optical components. 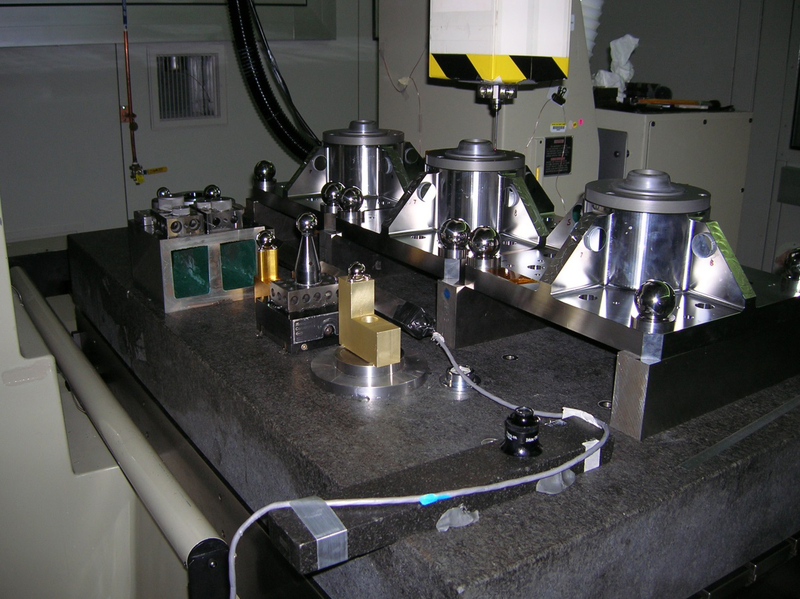 NIST’s M48 Coordinate Measurement Machine (CMM) measured the four mounts, which are 200 millimeters (7.87 inches) on a side and 150 millimeters (5.91 inches) high. The most accurate machine in the world for measuring parts on this relatively large size scale, the M48 CMM uses laser interferometry to measure the location of a ruby tip that is placed in contact with the components being measured. The room in which the measurements were done has a stable thermal environment that can be controlled to a few thousandths of a degree. The mounts were accurately measured to within 5 micrometers, the tolerance that NASA needed for these parts. “The precision of the backplane assembly has to be impeccable for the high-quality work they want to do with the telescope,” Stoup said. Three of the four James Webb Space Telescope Primary Mirror Backplane Support Structure fixtures on the NIST M48 Coordinate Measuring Machine. “They know we’re down the road,” said Stoup. “The same day they called about the parts, they drove them down here,” and he and his colleagues started work on the measurements that afternoon, he said. “There are so many pieces that go into it, and when you look at everything that needs to be done, you really see how impressive this telescope is. It’s an amazing project,” he said.